So, I stopped at the LCBO store (“liquor store” for anyone not in Ontario) on the way to my dad’s. One problem. Being a small store in this particular location, the selection was smaller than I had hoped. 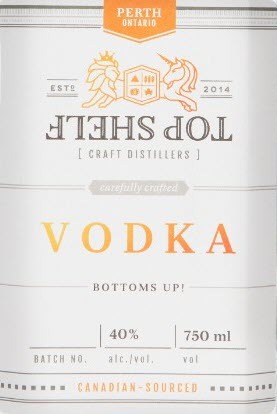 I did, however, see a familiar bottle and logo on the shelf of a new Gin I’d tried recently from Perth, Ontario’s Top Shelf Distillers. Since I really enjoyed it, I grabbed the bottle and bought it for my dad. 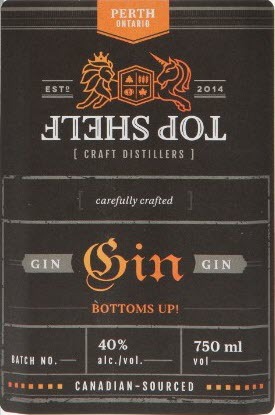 This is the label on the bottle of Top Shelf Gin I have at home, that I was picturing in my head as I browsed the shelves at the LCBO. Looks identical, right? Please? Yeah, not so much eh? Same logo, similar design, but black/white, dark/light, how could I possibly confuse this? I explain the Gin exchange thing to my dad when he opened it up and he checks out the bottle, but he also doesn’t read the label (or let it sink in), nor does my partner, but my stepmom looks at us quite puzzlingly when we keep referring to this bottle of Vodka as Gin. … and then we realize we’ve all missed the obvious. By this point, other than laughing our asses off, the bottle had already been opened to make martinis, so we had passed the point of returning it to get the right stuff. PS: while the Vodka was nice, I much prefer Gin martinis so we’ll be reserving the Vodka for other beverages over the next year! PPS: the next morning, I still couldn’t believe I’d made such a dumb mistake, so we went back to the LCBO store to see if they carried both types. Thankfully, they didn’t carry the Gin, only the Vodka, which I suppose explains why it was familiar enough I didn’t stop to read it. It never occurred to me that one brand would have both Gin and Vodka as most of the brands we see in our liquor stores are one or the other. Doh!